By the Queen Anne period, circular pedestal tables with the ability to extend were supported on pedestals with either three or four legs. 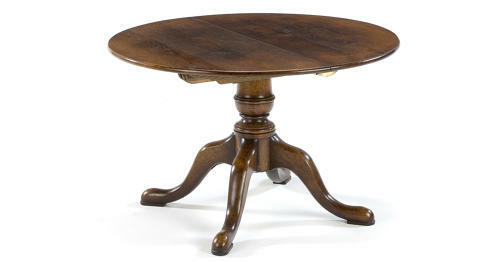 Period pedestal tables were a maximum of 4'6" in diameter, mostly under 48". Our oak pedestal tables are available up to 66" diameter, which are still practical and with the added flexibility of extension leaves, (with one or two extra leaves) ,one can seat an impressive dinner party.